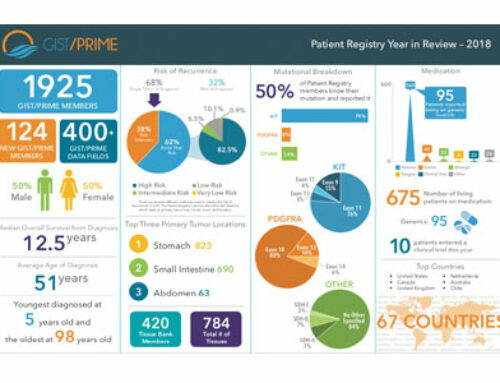 In patients that respond to imatinib, substantial reduction in tumor size occurs. However, RTK inhibitors fail to eradicate GIST cells in 95-97 percent of patients.14 Although the surviving cells appear non-proliferating, this state is reversible, necessitating life-long treatment. 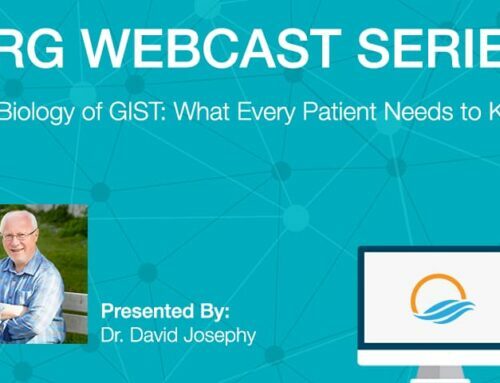 The significance of GIST persistence is that it sets the stage for secondary, drug resistant mutations.18 Therefore, it can be argued that targeting disease persistence should take precedence over the development of additional pharmacological agents against secondary mutations. GIST persistence during RTK inhibitor therapy could result from “escape” mechanisms expressed by the tumor cells. Alternatively, a pre-existing subset of cells not dependent on oncogenic RTK signaling due, e.g., to lack of significant expression of the mutant receptor could survive the treatment. In seven studies that investigated KIT expression in patients that underwent imatinib or sunitib treatment prior to surgery, 18 of 148 samples lacked KIT expression and further samples expressed low KIT, with the remainder showing no obvious change (reviewed in ref.19 and see ref.11). 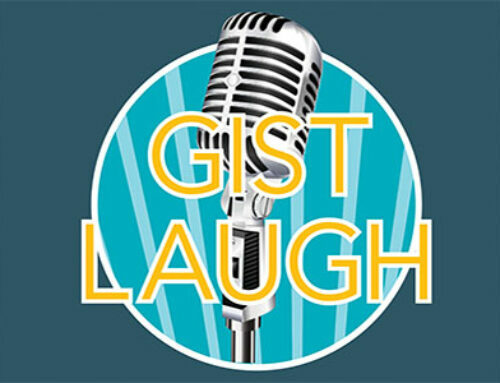 Thus, both mechanisms may contribute to GIST persistence. Typically, the cells expressing little or no KIT (KITlow/negative) had epithelioid morphology.19 Previously, we described a rare KITlow/negative cell type with epithelioid morphology in mice and demonstrated their ability to self-renew and differentiate into ICC both in vitro and in vivo, signifying their role as ICC stem cells (ICC-SC).4,5,20 Transformed ICC-SC gave rise to GIST-like tumors containing both epithelioid, KITlow and spindle-shaped, KIT+ cells.5 Importantly, both normal and transformed ICC-SC showed low sensitivity to imatinib. These findings are consistent with a GIST model wherein a small number of mutated ICC-SC gives rise to KIT+ cells representing the bulk of the tumors (Figure 1). Whereas RTK inhibition can keep KIT+ GIST cells under control, it may not eradicate the inherently imatinib-resistant KITlow/negative stem cell pool, from which the tumor is reestablished following the cessation of therapy. 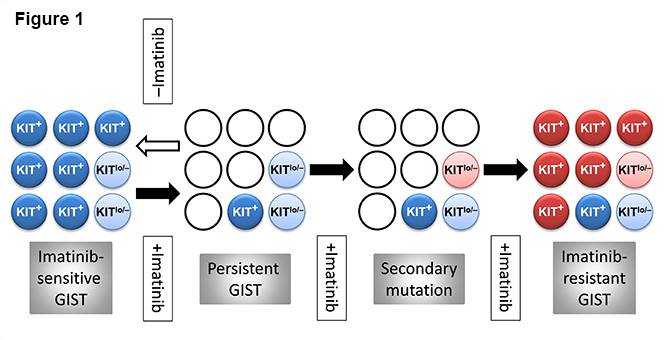 Acquisition of an imatinib-resistant mutation by the surviving precursors would again permit their differentiation into KIT+ cells and uncontrolled GIST growth.5 It follows that stimulation of KIT expression in the surviving KITlow/negative GIST precursors before the emergence of drug-resistant mutations could potentially restore these cells’ sensitivity to imatinib. 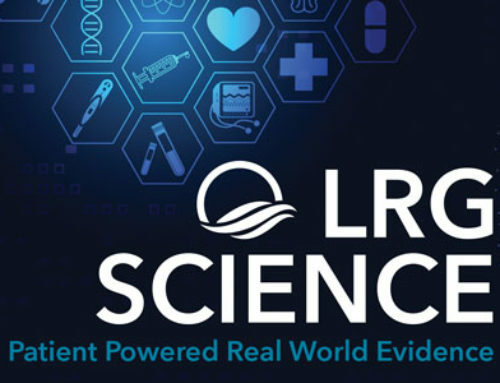 Although this model bears remarkable similarities to the model proposed to underlie disease persistence in chronic myeloid leukemia,21 its applicability to human GIST remains to be established. Figure 1. 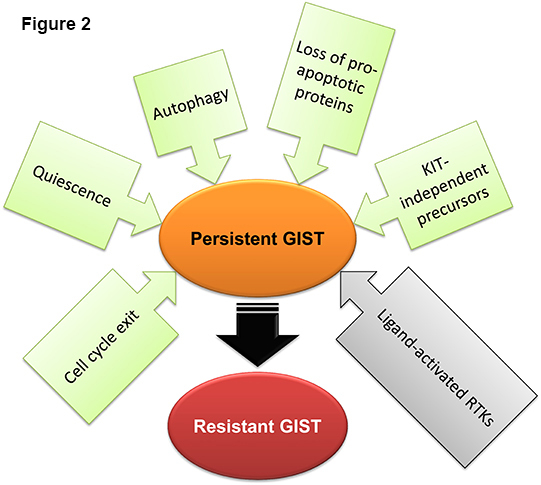 Hypothetical stem cell model of GIST persistence and acquired therapy resistance. Light blue circles: KIT-independent precursors carrying imatinib-sensitive KIT mutation but expressing very little or no KIT protein (KITlow/–). Dark blue circles: KIT+ cells arising from the KITlow/– cells carrying imatinib-sensitive KIT mutation. Open circles: dead cells. Pink circles: KITlow/–, KIT-independent precursors with acquired secondary imatinib-resistant mutation. Red circles: KIT+ cells differentiated from the KITlow/– precursors with secondary imatinib-resistant mutation. Filled arrow: imatinib treatment. Open arrow: cessation of imatinib treatment. GIST cells not dependent on constitutively active RTK signaling must draw on alternative pathways for survival. Pharmacological targeting of these mechanisms may provide additional means to eliminate cells causing disease persistence and also to treat SDHB-deficient GIST, which respond poorly to imatinib and related drugs.15 IGF1R is variably expressed and activated in several GIST subtypes and most robustly in pediatric GIST,15 possibly indicating their relationship to ICC-SC,15 which, unlike mature ICC, strongly express this gene.4 IGF1R inhibition led to cytotoxicity in KITnegative mutant cells,15 and is currently under investigation in a phase II clinical trial in GIST lacking KIT, PDGFRA or BRAF mutations (NCT01560260). In GIST that became KITnegative by long-term exposure to imatinib, transition from spindle-shaped to epithelioid morphology has been shown to be accompanied by overexpression of the RTKs AXL and MET.29 Furthermore, epidermal growth factor receptor (EGFR) expression and activation has been reported in GIST lacking KIT or PDGFRA mutations.30 EGFR expression and activation appears to be common in both imatinib-treated and untreated GIST along with the expression of several EGFR ligands.29,31 Together, these results indicate that activation of alternative RTK pathways by ligands released in the tumor microenvironment may be common in GIST including tumors not dependent on KIT/PDGFRA signaling. In conclusion, disease persistence in GIST involves multiple mechanisms including activation of signaling pathways triggering the cells’ exit from the cell cycle, autophagy, loss of pro-apoptotic proteins, downregulation of KIT/PDGFRA expression or selection of GIST stem cells that do not depend on KIT/PDGFRA signaling for survival due to expression of alternative receptor tyrosine kinases (Figure 2). In view of the molecular diversity of GIST exposed to long-term imatinib, eradication of residual tumor cells and curing GIST will likely require individualized combinations of several approaches tailored to the tumors’ genotype and phenotype. Figure 2. Mechanisms of disease persistence in GIST. Green and gray boxes signify cell-autonomous and microenvironmental mechanisms, respectively. Abridged and modified from the following article: Ordog T, Zörnig M, Hayashi Y. Targeting Disease Persistence in Gastrointestinal Stromal Tumors. Stem Cells Transl Med. 2015 Jul;4(7):702-7. doi:10.5966/sctm.2014-0298. Epub 2015 May 1. PubMed PMID: 25934947; PubMed Central PMCID: PMC4479627. ©AlphaMed Press, 2015.